A happy new year to all of our readers and contributors. 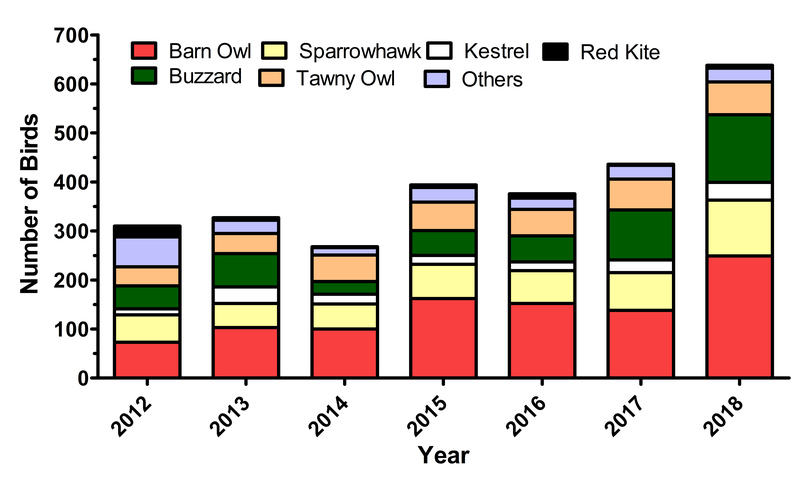 We’d like to thank all those who submitted birds to the PBMS in 2018. In total, we received more than 600 birds that had been found dead in 2018 (as well as 58 birds from previous years but submitted in 2018). The more birds we receive, the better we able to select the birds to analyse, to inform us what factors determine the prevalence and level of contaminants in raptors. He continues, “While it is sad that these birds are killed on the roads or die due to starvation or disease, we hope to make good use the samples they provide, to identify the potential impacts of pollutants on raptor populations. These barn owls will be used to monitor the success of new usage regulations for rodenticides, and so we ask the public to continue to submit owls and other raptors to the scheme”.